Asma Soussi, zelf groot fan van Henna Kunst, volgde Hand of Fatima op Instagram. Gefascineerd door het werk en de verhalen die Fatima deelt op haar feed, besloot ze contact te zoeken. Het klikte meteen, met als resultaat een tof interview (in het Frans) voor haar blog Culture Cherifiènne. Ben je de Franse taal niet machtig, dan lees je hieronder de Engelse vertaling. What does the Hennaplant mean to you? For me the henna plant has brought magic into my life, unlike anything else. Ever since i was a little child i was fascinated by the color this plant brings onto the skin. The dipped fingertips or the orange nails from my grandmother and aunts or even the little strand of orange hair that accidently peeked out of my grandmother headscarf…i found it al fascinating. .My first time henna ritual when i was 4 years old took place when the neighbouring girl from my grandmother came into her house (where we were staying for vacation) and applying henna with a little stick. Just a very bold fishbone design on both my hands and feet. I loved it! Every summer when travelling back to family i started asking for henna, from the moment we jumped in the car untill we arived in morocca…can i have henna? Who will make me henna, i want beautiful henna….and so on….I drove my family nuts. As i got older they hired me a professional neqacha that put bridal hennadesign om both my hands and feet and gave me her syringe so that when i got back in holland i could practise….that is how the story started. Through Henna I’ve learned so many things that i could have never learned through formal education. I have been welcomed in the households of hundreds of differnt families, from the richest to the poorest, from Dutch to Chinese and everything in between, from muslims, buddhists, catholics, jews, hindou, atheists and even more than i can mention. I have seen generous people and stingy people. Happy and sad. The beauty and the ugly of our human kind. I owe all those experiences to henna. I have been able to travel to different places and countries to teach my way of doing henna and sharing my philosophies as an artist. And it surprised me that there were hundreds of women that actually wanted to know everything i had to tell. Those experiences are treasured memories in my heart. Because doing Henna is my passion and my lifestyle .Most of all Henna brought me humbleness and thaught me how to be greatfull. Because wherever you go there is always more to see after you peel of the first layer and then the second and so on. Suprises can catch you everywhere if you are willing to see. I feel humble because i’ve been so close (as an outsider) to someones most precious moments in life. Hennadesigns don’t last forever, so even though you have created your best work ever on someone, it will vanish. That makes you feel humble about your arte as well. And put your feet back to the earth , no time to dwell and amire your art forever. You have to create and perform every time all over again, nothing to brag about. Just work hard and stay humble.It is like a circle, neverending routine. To put it all simply i would not have been the same person if there wasn’t henna in my life and also i cannot imagine a life without henna. The Henna Ritual has a significant place in the life of Moroccan women. In your opinion, how are these ephemeral tattoos perceived by Dutch women? That is an interesting question. When i started my business Moroccan people would say to me "Dutch people will never love henna they won’t pay you to do that it jus tour tradition”…..And Dutch people told me….”you want to make money with henna? That old fashioned ritual ….do you guys still do that?? ?” So the odds were stacked against me but I have proven everybody wrong!! Thank god my family supported me, they believed in my dream. It turns out that Dutch women love the art of Henna. To be honest no matter from what culture you are from whatever country you are, no one can repel the magic of henna when it seduces you…hihi…. Ne w Rituals are happening just right now , all the pregnant women that let me hennafy their bellies….it is just beautiful. It is an new version of our Moroccan tradition. We never did henna on pregnant bellies, but it is a great way for women nowadays to celebrate their pregnancy. I’m very proud of the fact that with my henna Art i’m writing a new chapter in the history of Henna. That means Henna has a future in Europe and new rituals will be established . I came to learn that Western women longed for celebrating sisterhood. It is a part of europen culture that is lost. And with the influence of our Moroccan Henna rituals Western women too get the occasion of getting in touch with feminity, sharing and caring in womens circles. Dutch people were very wrong to think that our tradition is old fasioned. It has never lost its modernity, if you would ask me! It is very interesting to see that nowadays most Moroccan brides in the netherlands choose for indo arabic style for their wedding henna (even though Moroccan bridal fessi is making its revival).It is so inpriring to see that all cultures are coming together. Under that influence patterns change and develop; new henna fashion is created. The woman decides herself how she wants to look at her wedding In the past it was mainly fessi or moroccan khaliji. And i remember, back in the days, the nqachet in Morocco just did whatever they had in mind, same as the ziana’s…as a bride you just had to undergo it all. Whereas a bride in present times chooses precisly how she likes anything from weddingcards, to Music, taqchita, maquillage, cakes ….everything. The Moroccan bridal services are getting more and more professional and the branch is growing as never before. I never speak of temporary tattoos. I want to prevent using the word tattoo or tatouage. Because tattouage is a form of body art on it’s own. And when using that word it’s suggest that people can choose any color that they like and also that you van choose an image and that being created on the skin…..This is all opposite of what Henna Art is for me. That’s how i call it Henna Art, You can not choose a color, henna will always be a tone in the mahogany range. I don’t do tattoo-like images such as koi fishes, chinese characters or flash style tattoos. I always work intuitive. My clients can say their preferences in terms of different styles and lay out (of course i love to work in my signature style lol) And then I create a unique piece that follows the energy of the client. And i explain to them what the symbolism signifies. And most of the time they can relate to it. It is a magical exchange of energy between me and my client. I prefer to work in a calm setting so that the client can absorbe the experience. I don’t copy other peoples work nor my own, i want it to be unique every time. All of that can not be captured in the word Henna Tattoo. I want people to understand what i do before they book a henna ritual. So i choose all my words very carefully. Do you use Henna techniques inspired by traditions other than Moroccan? I think of Mhendi for example? I thought that as an artist it is important to learn and know about different styles and diferent techniques. But my first love was Fessi! It took me years to understand how exactly the authentic Fessi style is created. Even though I could see all the patterns in my memories from childhood. It is hard to transfer that to the skin. I practised, experimented and analysed. To reach the stage of understanding why one designs is authentic fessi and why another design looks like it but is not it…..not really…. If you follow these 5 steps strictly you cannot go wrong. All the distinctive looks, build up and elements are covered in these 5 steps. It is very helpfull for other henna artists that want to create Fessi Designs. Besides my love for Fessi, through the ten years that my business exists, i have developed a very unique signature style that is internationally recognised and appreciated. In my signaturestyle you can still see some Fessi elements (because that remains my foundation) But i use curved lines and add elements that came out of my fantasy. I don’t look at other henna artist s work for inspiration, I get a lot of inspiration from Amazigh jewelry and tapistery, and combining all of that together you will get Hand of Fatima style. This is ofcourse my facorite style, because it feels so natural for me to do it that way. Inspiration never leaves me…I always have to many new ideas circling in my head and not able to execute them all. I do like to follow other Henna artist on social media and my henna students, to encourage them and see how their works evolve. 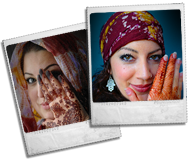 Social media has brought the global henna Community a platform to interact with each other as if we were neighbours. It is very inspiring. "Hand of Fatima" is a concept store that offers products around the Henna ritual. Tell us what motivated you to launch this e-shop? The main reason for starting my webshop is the fact that high quality hennasupplies were not available in the netherlands. Yes there are several shops that sell hennacones, but these products contain chemicals that can harm the skin and health. I needed high quality henna supplies for myself, because even when you master the technique….if your henna powder is too grindy your lines will not be neat. I found my hennapowder in India, it is superfine and on top of that also organic. So good for our health and the environment. All of that is important to me. Same goes for all the other henna products we sell. Only best quality is good enough for Hand of Fatima. When i teach my workshops and classes i can provide my clients with the right supplies as well. And my webshop is also there to encourage everyone that wants to play with henna. Wether you are a newbe or a professional everyone can buy from us. At the same time our webshop is also a source on how-to-make-henna knowledge. You can find answers on most of your question and if not, just contact us. We have helped a lot of aspiring henna artists. 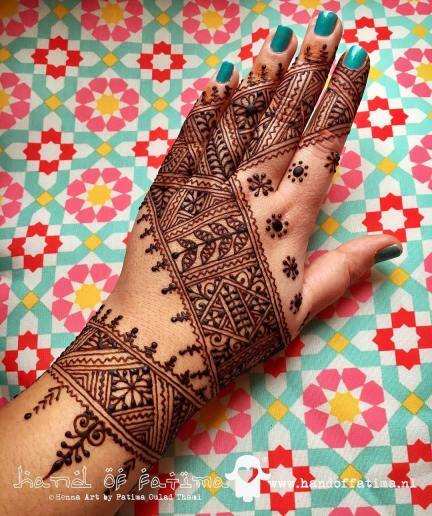 Have you done Henna for Moroccan brides? Can you tell us an anecdote from your experiences? In my beginning years as a Neqacha i have been working for many brides, Moroccan, Indian, Pakistanian, Dutch, Somalian….you name it. Nowadays I hardly do bridal henna parties. I focus on teaching and private appointments, because i can schedule that to my own wishes. If you ask me to tell you an anecdote i have to think hard because sooooo many experiences in my memory, good ones and bad ones….. I think my most precious memories all include children. They are the ones that i love the most. They are always so fascinated by everything that is happening at henna party. Love it when they dance with the elder women, or when they secretly stealing candies from the table. She was watching and observing my every move, cause she knew as soon as i was finished it would be her turn. So i was almost finished with the feet and i told her to sit down already. She took off her golden belgha and took her place on the sedari, on the other side and started sitting like l’7arossa so i did her right hand, added some glitters (wich little girls love ofcourse) and i expected her to show me a beautiful smile of henna happiness, but when i got up cause i was finished she started crying out loud…like really loud…it came so unexpected for me…she is litterally the only child ever in my henna career that started crying after i applied the henna.….meskina, she thought that she would be fully decorated both hands and feet like the bride…after all it was her turn. It was easy to imagine her sadness, she had been by my side for 4 hours waiting for her turn, so i added some extra henna on her.I couldn’t help myself to feel sorry for her. Unfortunately i cannot remember her name.